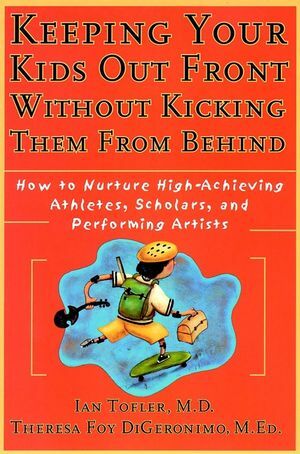 Keeping Your Kids Out Front Without Kicking Them From Behind is acommon sense guide for moms and dads of talented and giftedchildren. In this practical book, authors Dr. Ian Tofler andTheresa Geronimo--experts in the field of parenting--present theirSeven-Step Program for Encouraging and Protecting High-AchievingChildren. This innovative program offers guidance for establishinghealthy boundaries between parents' ambitions and the needs oftheir talented children and clear-cut instructions for helpingchildren balance achievement with happiness. To read Debating What is Best for Our Children, an excerpt fromthis book,click here. IAN TOFLER, M.B., B.S., is a Harvard-trained child and adolescent psychiatrist in practice in Los Angeles. He is the inaugural chair of the Sport Psychiatry Committee of the American Academy of Child and Adolescent Psychiatry. THERESA FOY DIGERONIMO, M.Ed., is coauthor of How to Talk to Your Children About Really Important Things and How to Talk to Teens About Really Important Things (Jossey-Bass, 1994, 1999). AN UP-CLOSE LOOK AT PARENTS AND CHILDREN. Debating What is Best for Our Children. A SEVEN-STEP PROGRAM FOR ENCOURAGING AND PROTECTING HIGH-ACHIEVINGCHILDREN. Step 2: Selecting Classes, Schools, and Camps that Cater toHigh-Achieving Children Evaluate Four Motives for Special Training:1) Improvement of Skill, 2) Supportive Environment, 3) EliteExposure, 4) Resume Building; and Advice From the Experts. Answering a Cry For Help.